Students from the Saguenay–Lac-Saint-Jean (Quebec) region recently got front-row seats to the engineered wood products manufacturing process. 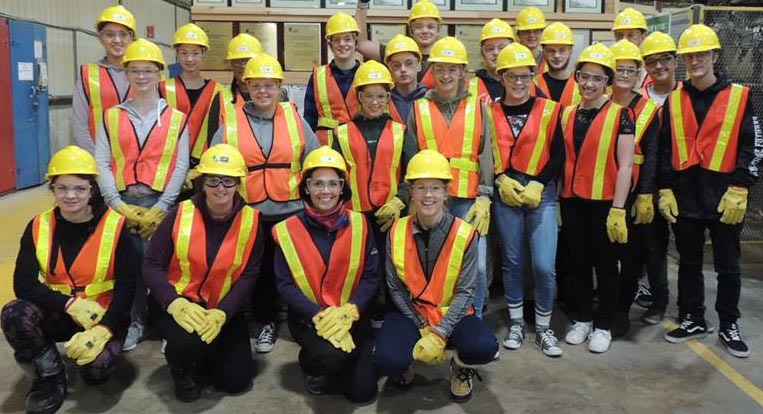 On January 17, a group of over twenty students from Séminaire Marie-Reine-du-Clergé, a high school located in Métabetchouan-Lac-à-la-Croix, visited the Resolute-LP – Larouche facility. On January 21, a delegation from Kassinu Mamu high school, from the Innu community of Mashteuiatsh, visited our other engineered wood products facility, Resolute-LP – Saint-Prime, as part of a personal development class. The students appreciated their experience, particularly given both facilities remained operational during the visits so the students could observe the entire manufacturing process firsthand. As safety is the top priority at Resolute, all students were required to wear protective gear at all times: safety boots, hard hats, cut-resistant gloves, safety goggles and ear plugs. These precautions demonstrated Resolute’s diligent approach to health and safety. We would like to thank the students and teachers of Kassinu Mamu and Séminaire Marie-Reine-du-Clergé high schools, as well as the Association forestière Saguenay–Lac-Saint-Jean for choosing Resolute!